It’s just before dusk, and the hottest spot in Uptown is hopping. Literally. Dozens of kids and teens, and a handful of adults, pound up and down the basketball courts at Greenlaw Park, jumping to shoot, block and dunk. Dozens more stand on the side lines, sizing up the competition and cheering them on. Nearby, children play on the colorful playground while parents sit and chat or exercise on the walkways in and around the park. This park and Uptown-Pinch’s other half-dozen green spaces are places of growth for the area’s plant life but also for its people. 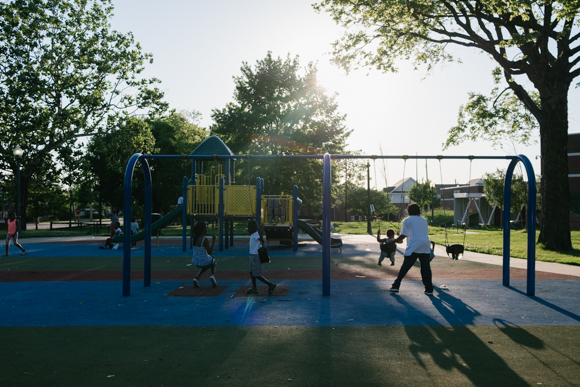 Parks and other green public spaces are critical for thriving bodies, minds and relationships and are especially important in low-income and majority-Black neighborhoods like Uptown. The greater Uptown-Pinch area, which includes both Harbor Town and the area west of St. Jude Children’s Research Hospital, is home to several traditional parks with features like playgrounds, walking trails and fields or courts for sports. Of note are Bickford Park and community center, home to one of the last public pools operated by the city, and Winchester Park, established on the site of the city’s first cemetery. Greenbelt Park has no playground or sports facilities, but it does offer plenty of open space and a 1.5-mile walking trail with some of the city’s best views of the Mississippi River. While playgrounds and fields might seem unremarkable, they’re actually critical to the health of a community. Numerous studies have shown that having easy access to parks and open spaces increases the amount of physical activity of both children and adults by as much as five times. More specifically, parks with playgrounds, sports facilities and walking trails are up to seven times more likely to be used for exercise than spaces without these amenities. Parks are critical to a healthy childhood. They help kids develop critical thinking skills, improve cooperation and long-term mental health, and build their sense of adventure. Green space is also a matter of racial equality. Majority-black and brown communities have less public green space, less amenities in the spaces they do have and are often less well maintained than their counterparts in majority-white areas. Lack of maintenance significantly impacts rates of use and perceptions of safety. 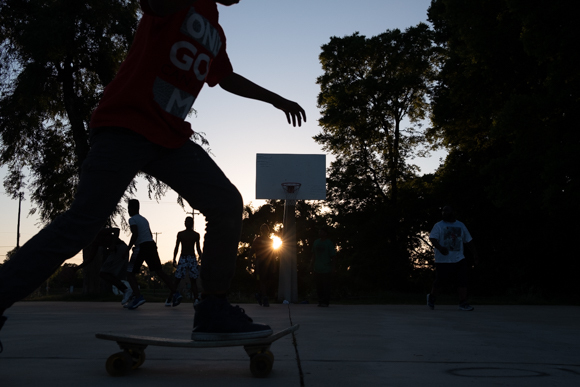 African-Americans have higher risk for obesity, diabetes, and other diseases that can be reduced with increased activity, making it especially devastating when majority-black communities lack plentiful and beautiful green space. In Uptown-Pinch, there’s been recent momentum in the movement to take a deep, grassroots ownership in maintaining these community assets and creating new opportunities, including community gardens and the new Chelsea Greenline that, upon completion, will link Uptown to people and greenways across thousands of miles and multiple states. For the Uptown neighborhood, the health and beautification benefits are important, but it’s the connectivity that’s key. “[The parks are a] great spot for people to meet and share life stories, what they do. You can see about getting together, talk about the possibility to exercising together, inviting them over, inviting them to church,” said Nathan Sawyer, a resident for 10 years and one of a council of pastors at Uptown-based Grace Church. The Uptown Community Association regularly uses Uptown Park — an expansive grassy median located between Uptown Street and Greenlaw Place that features a pavilion and paved walking trail—to host community-wide events like a chili contest, pumpkin carving and even a recent concert. Resident Mary Ferguson’s grandchildren use Uptown Park to “burn off all the energy in the world,” and she recalls a beautiful wedding held at the pavilion. “This park is sort of the focal point and has been for a lot of the social life of the neighborhood,” said Kaleigh Donnelly, president of the UCA. Not just parks, Uptown revitalized its community garden in 2017, creating another unique opportunity to gather and support the neighborhood. The garden was originally founded in the mid-2000s, but when Njeri Fombi and her husband Melek moved to the neighborhood in 2016, they found the garden abandoned and overgrown. Last year, the garden made its return, providing food for residents, community meetings and even supplying fresh produce for The Office @ Uptown’s cafe. There’s just something about the act of feeding someone, of sharing a life-giving resource that’s been grown and prepared with care and love, that binds people. It also provides a source of healthful food in a neighborhood that lacks a grocery store or other regular source of fresh produce. “You never know what’s going on with a person. It might be somebody that really needed the food they got from you because they didn’t have any food to eat,” said Fombi. For all its current assets, it’s the most recent and soon-to-be additions to Uptown-Pinch that are most exciting. In May, Grace Church and Memphis Athletic Ministries began a one-year adoption of Greenlaw Park to help document and improve maintenance issues and overall upkeep. Starting in mid-June, Bickford Park will participate in the city’s new Play Your Park program. Weekdays from 10 a.m. until 6 p.m. until Aug. 3, staff will coordinates games and activities and provide lunch for any youth who’d like to participate. People from all walks of life mingle beneath the "branches" of Treedom Memphis. (Cole Bradley)Uptown-Pinch recently acquired a brand new green asset. On June 2nd, a vacant, grassy lot at the corner of A.W. 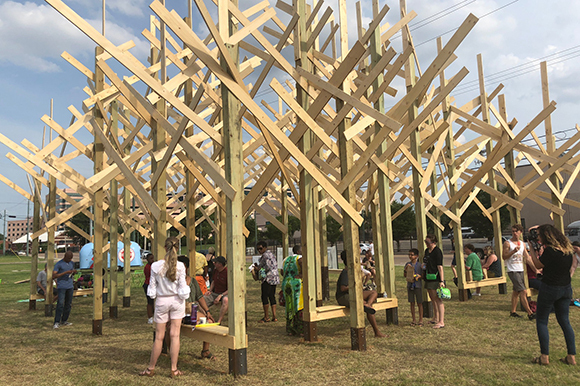 Willis Avenue and North Second Street was transformed into a one-of-a-kind gathering space with the installation of the 26-foot-tall Treedom Memphis sculpture. The functional art doubles as a venue for concerts, classes, picnics and more. The Uptown community garden recently acquired a new plot of land for a second garden in addition to its current location at North Fourth Street and Sycamore Avenue. The new site at North Fourth Street and Keel Avenue will offer more space for bigger beds, as well as closer proximity to more residents for greater involvement. Arguably the most exciting of the new developments and the biggest impact to neighborhood connectivity is the Chelsea Greenline. It is expected to break ground by Spring 2019 and, once complete, will stretch 2.5 miles from the trailhead at Chelsea Avenue and Evergreen Street in the Klondike-Smokey City neighborhood to Washington Park at Marble Avenue and North Second Street in the far north-west of Uptown. But this greenline isn’t a stand-alone trail. 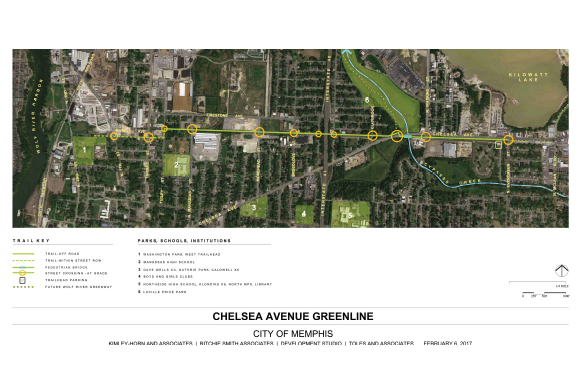 According to Andrew Israel, executive director of the Greater Memphis Greenline, the Chelsea line is the final piece of the organization’s original vision developed at its inception in 2004. The Greater Memphis Greenline started as a lobbying and advocacy group for a plan to connect the city through a network of greenlines (trails, bike lanes, or linear parks like Greenbelt Park). They’ve led or been a key player in projects like the Shelby Farms Greenline, the Hampline, Big River Crossing, the installation of hundreds of miles of on-street bike lanes, and the Memphis and Shelby County Bike Map. The Chelsea Greenline marks the last of their major infrastructure projects. With its completion, Memphians will be able to ride a continuous greenline from Shelby Farms to the Mississippi River, with switches from bike-pedestrian trails to sidewalks or bike lanes but no breaks in the route. Prior to the final planning stages, the GMG will meet with community members at the proposed trailhead and Washington Park to seek their input and perspectives on the new addition. “They really see it as a healthy opportunity, an opportunity for the kids to play and ride in a safe environment as opposed to on the street, and they’re also seeing how this trail can bring folks from other neighborhoods,” said Israel. It also gives Uptown residents a beautiful and safe route to other parts of the city for both work and play. “It’s not just the East-to-West flow but the West-to-East, the removing of barriers and the connectivity...The connectivity is the thing we’re most excited about. Now, if you’re in the Uptown area, you have a 2.5-mile access to get to other areas [of the city],” said Israel. 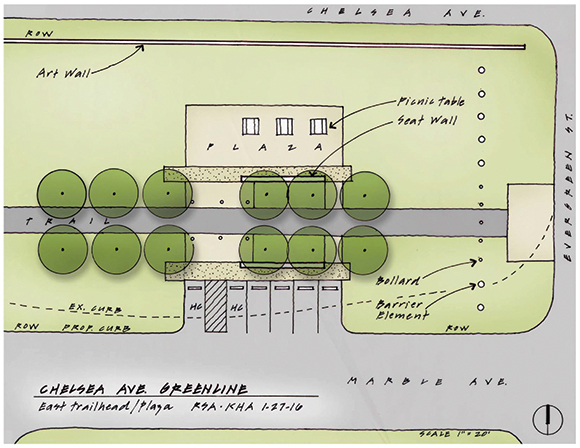 The Chelsea Greenline trailhead at Chelsea Avenue and Evergreen Street will include public art, parking, benches and a public plaza. And it’s not just other Memphis neighborhoods. The upcoming addition of bike lanes on North Second Street would connect Washington Park and the Chelsea Greenline to the Mid-South Regional Greenprint’s plan for interconnected greenways across Mississippi, Arkansas and Tennessee, as well as the Mississippi River Trail, a 3,000-mile series of greenways that stretches the length of the Mississippi River from Minnesota to the Gulf of Mexico. This connectivity not only gives residents of Uptown and the Pinch the opportunity to meet new people from across the country but to showcase the neighborhood’s green amenities, restaurants, shops, museums and more. The route for the Chelsea Greenline will start at Chelsea Avenue and Evergreen Street, follow along Marble Avenue, and end at Washington Park on N. Second Street. It would also be a big boon for Washington Park itself. One of the largest of Uptown’s green spaces, Washington Park features a basketball court, walking trail, and playground, but is the area’s most underutilized park. Terry Hoff, executive director of Oasis of Hope, thinks that’s due in part to a lack of residences within walking distance. Oasis owns a section of land abutted to the back of the park and the abandoned railroad line that will soon be the Chelsea Greenline. They would love to develop the land for multi-family apartments so that residents could step outside their front door directly into their park and onto their greenline to meet people from all over the city and country. With the Chelsea Greenline moving from planning to construction phase, which is managed by the city, the GMG is shifting its focus from lobbying and advocacy of major builds and investments to working in collaboration with other organizations on high-impact, quicker wins. For the Chelsea Greenline, they’re working on a public art project for the I-240 overpass that crosses the trail. There’s also talk of supporting some of the city’s underserved parks and working with Explore Bike Share (also headquartered in Uptown) on a North Memphis census of biking and green space usage that would include Uptown and the Pinch. Whatever the next steps in the development of Uptown-Pinch’s green infrastructure, the neighborhood is ready. Residents, including Mary Ferguson, Kaleigh Donnelly and Nathan Sawyer, all love the small-town, friendly and safe feel of their neighborhood, and having more public spaces and events helps to grow the connections so important to that sense of pride and belonging. The community is excited to show off their growing green infrastructure to Memphians and guests alike.